This Stevenson Family is related to the famous poet and author Robert Louis Stevenson. Most of the Stevenson descendents in this line now live in Australia and New Zealand. 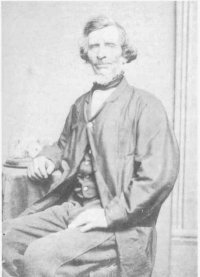 Joseph was born in 1802, in Fordyce, Banff, a northern county of Scotland, facing the Shetland Islands. He was the sixth son in a family of 10 children. The nearby cities of Glasgow and Edinburgh had been ancestral homes of the Stevenson clan, from the 17th century. Joseph could readily trace his family back 3 generations to Robert Stevenson, who was born in Glasgow in 1720. His own son Robert, born at Christmas Hills, in 1845, would be the 4th generation in 125 years descending directly from this great, great grandfather just as the famed writer Robert Louis Stevenson would also be, when born in 1850, the 4th generation in descent from the same ancestor.